Thread: CWC Automatic or Quartz? Re: CWC Automatic or Quartz? I own some nice quartz watches, but I bought them before I really understood what a watch could be. I wish someone would have educated me years ago. If your gift is for a potential collector, I'd suggest that you start him/her on the right foot and get the automatic. The gesture means more because you know what it means. If he or she decides that convenience is most important, they can buy themselves a quartz. In the meantime, you will know that you gave the best choice. Eventually, the new owner will come to realize what you had done. For a "regular" person quartz is the way to go. If they remotely have any interest in watches at all I would go for an automatic they may not "get it" at first but will likely grow to appreciate it. Nice collection Scooby, whilst I'm waiting for the 1983 reissue, I've just purchased my second G10 but in Military Green with a T dail and already arranging for a Desert Storm edition too. I personally love the T dial but may start on the L's next lol Totally addictive. Also love my Seiko too amongst the G Shocks. I like how thin the CWC Quartz Diver is, and how it forms to the wrist as long as you don't have too thick of a strap running around it. I had an auto briefly, but didn't like how the caseback made it stick up farther. With the added thickness of the strap it seemed a bit top heavy. The ETA 955.122 is very accurate and durable, and it's quite easy to do a battery swap on your own without the risk of messing things up. 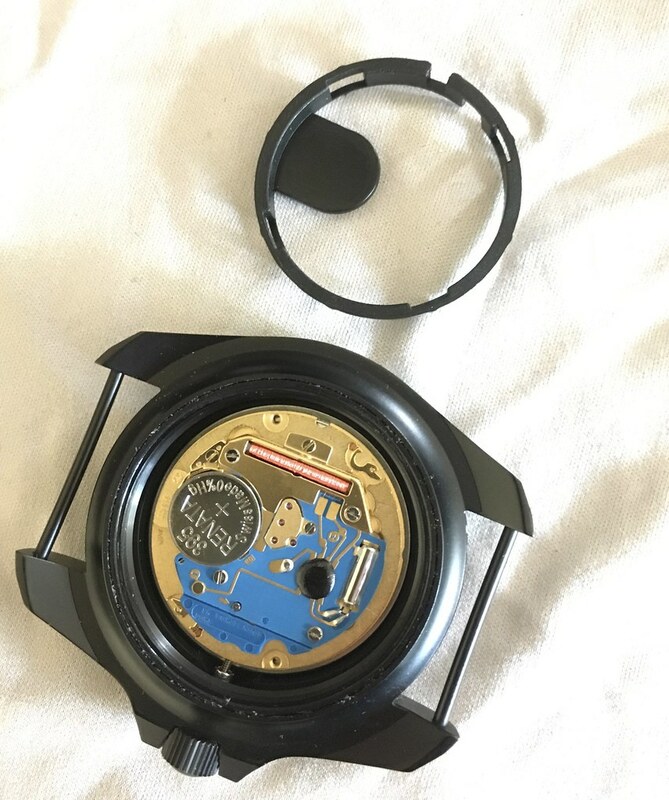 If the movement ever goes wonky for whatever reason, they are $40 to replace. Much cheaper than a service on an auto. Paul Ramon and scooby like this. I chose quartz since that's what's issued, and it's thinner. No date was a must for me so it can be a grab and go piece if I don't want to wear a G shock or set another watch. The new issue with lumed bezel and T dial sounds fantastic. 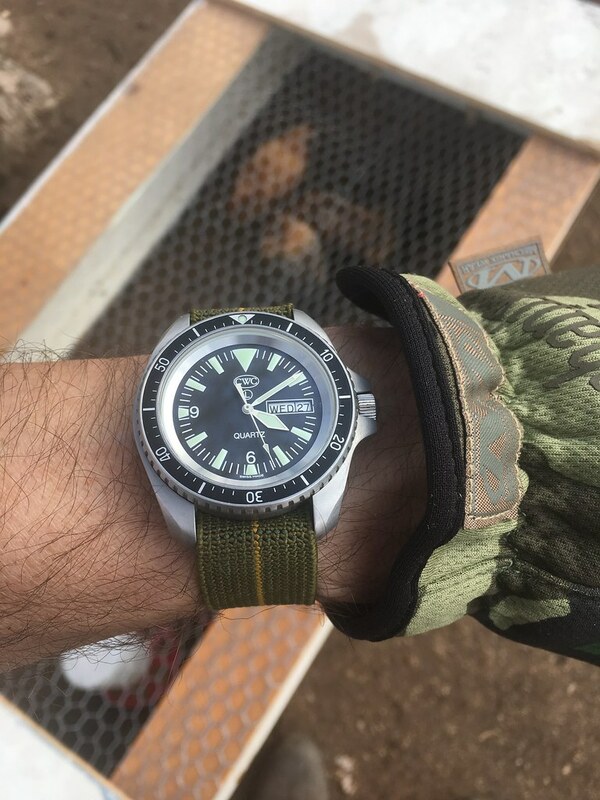 2014 RN Diver with a spare SBS dial I had laying around. I agree on quartz,for the convenience and durability but also the fact that many people do not enquire about a service when a watch starts to perform poorly,they simply put it in a drawer or the garbage.Then buy a new one. The reissue is too big for me but looks great. I vote automatic! I went cheap and got a WMC G10 Hybrid and didn't realize it's a kinetic. Hated it until I knew what I had, and added some Seiko kinetics to the collection. Now I just drop it on my Seiko kinetic charger and it ticks away without any crazy arm swings. Automatic and quartz watch in 4 second photo.